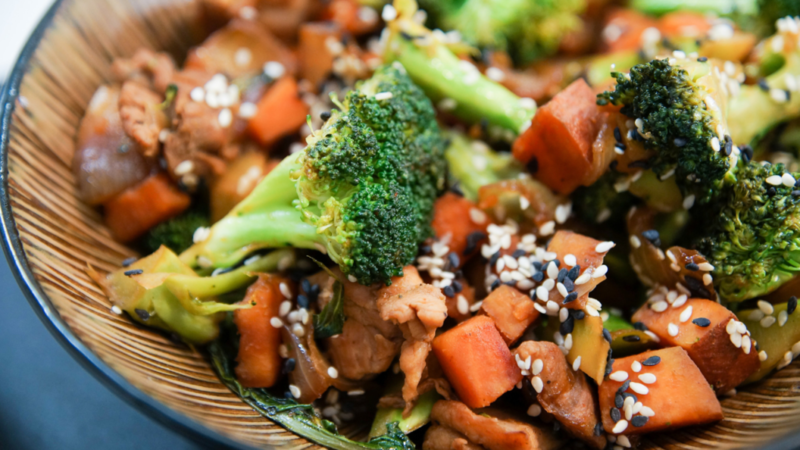 Stir Fry’s are an easy way to hit all the food groups for a tasty and nutritious meal. Choose a protein (chicken, beef, pork, fish, tofu, beans), a carbohydrate (rice, sweet potatoes, noodles) and add some veggies with sauce and your good to go. We love pairing this with miso soup but it's optional. Heat water in a pot over high heat and add nori. Let simmer while you chop the veggies and chicken and prep the stir-fry. Heat skillet to medium heat and add sesame oil. Add chopped sweet potato and saute for 3-4 minutes. Add onions and garlic and cook for another 2 minutes. Lightly season with salt and pepper. Add the chicken, soy sauce and red chili flake and cook for another 4 minutes, stirring frequently. Finally, add the broccoli and cook for 3 minutes, or until tender but not mushy. Add scallion and miso paste to water and whisk until combined. Serve with stir fry and enjoy! *If things are looking dry, add a splash of water during any point in the sautéing process. Why isn’t there any nutrition information, such as carbs, and sugar and sodium listed?